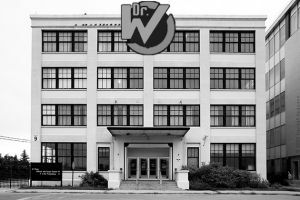 Dr. Wily's Lab is a large building on the northwest side of Shrike. There are robots there. While Nakajima Robotics creates robots for manual labor like construction and mining, Dr. Wily's lab produces companion-type robots for working directly with people. They aren't exactly Reploids but they're close enough. Curious adventurers can find this place on the northwest side of Shrike, just off of Boston Avenue. The only two employees of the lab are Dr. Wily and his colleague, Dr. Light. They are assisted by numerous robots and androids in their work. Their achievements are widely recognized, even by the Reploid community. Doctors Light and Wily were employed by Nakajima Robotics for a decade before being fired, because Wily was found siphoning resources and funds from other projects. Light has claimed ignorance to his partner's wrongdoings since and their personal and professional relationship has since been shaky. Doctor Light now owns his own laboratory in Shrike where he continues developing robot technology for public projects. Doctor Wily has been arrested several times under charges of conspiracy and illegal distribution of arms and weaponized robots. He has been acquitted every time. He is also under investigation by the Repliforce under charges of reploid slavery. - First I'll foight SnakeMan! - Then I'll foight GeminiMan! - And MagnetMan can put those buggers up I tell ya! - And that wanker Shadowman! - Then we'll foight some more and deal with an inevitable betroyal! "Dancers might have-a bit of trouble confusing robots. Electric and Fire magic can be-a little helpful. Always anticipate-a powerful foe to pull out an unexpected attack!" This page was last modified on 14 February 2016, at 21:05.